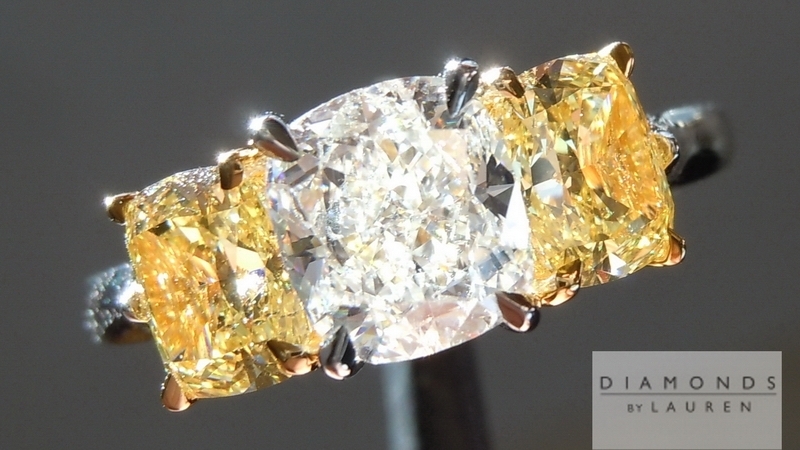 We chose two beautiful Fancy Intense Yellow cushion cut diamonds to flank this beautiful center stone. 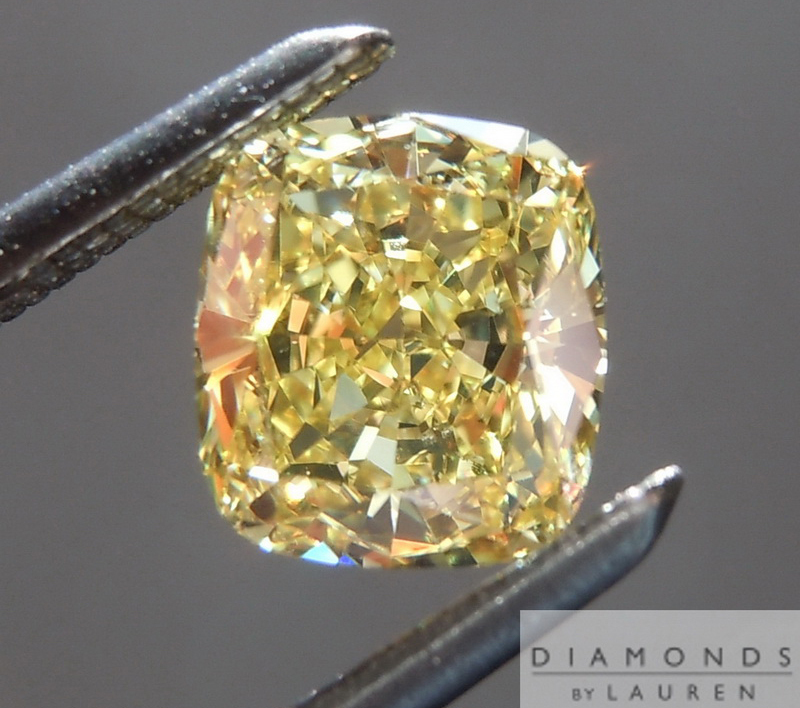 Both are a .83ct Fancy Intense Yellow SI2 cushion cut. diamond. 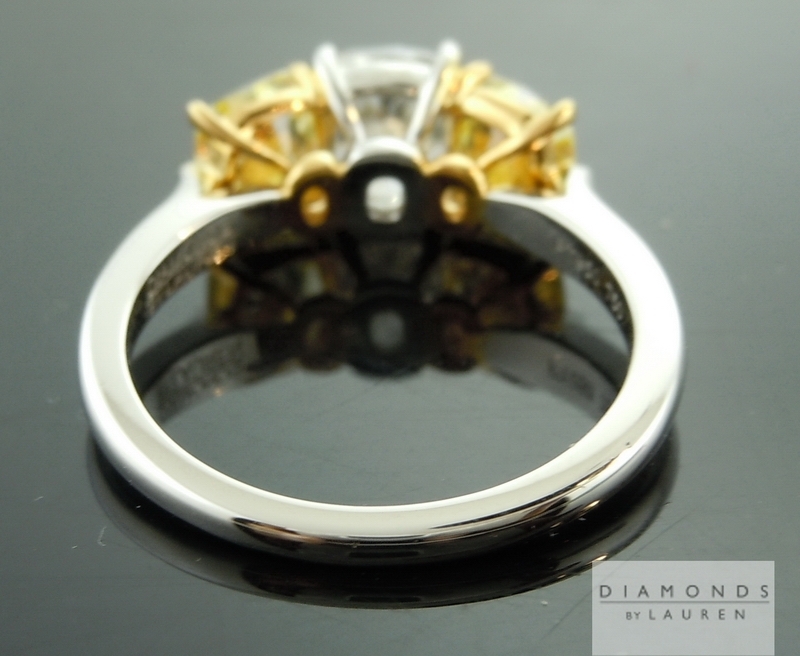 Each is lovely in its own right, but together they really tie in the beauty of this piece. The Uber guys knocked this one so far out of the park, you can't even see that park. The lines are so fluid- its like sculpture. The contrast between the stones is remarkable. 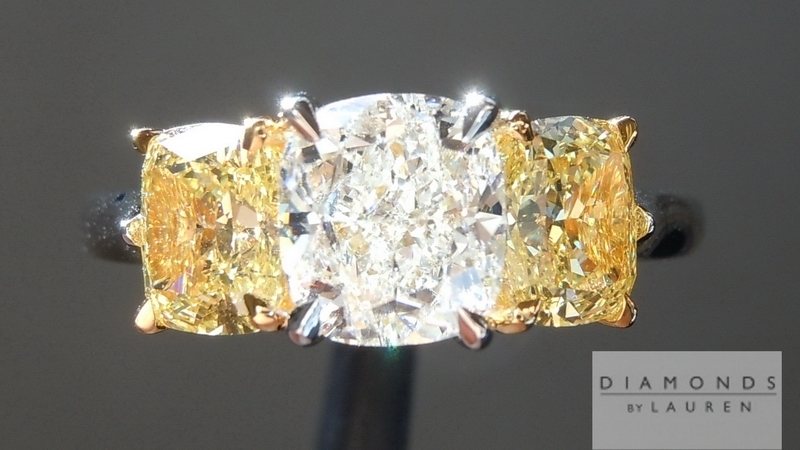 The G looks icy white, and the intense Yellows look like Vivid Canary Diamonds. 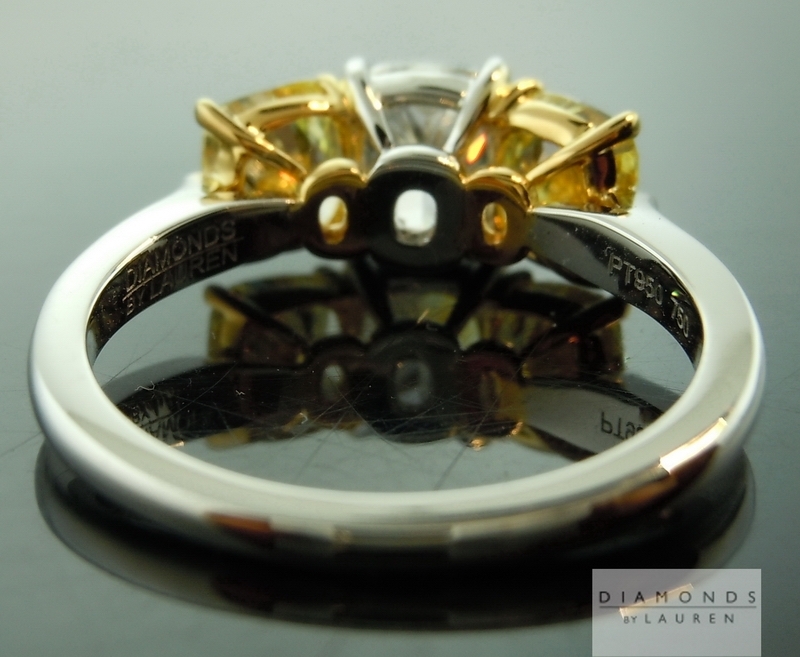 Proportionally, the stones fit together perfectly - the side diamonds are smaller, but very substantial in relation to the center. The ring is impressive in size as well. 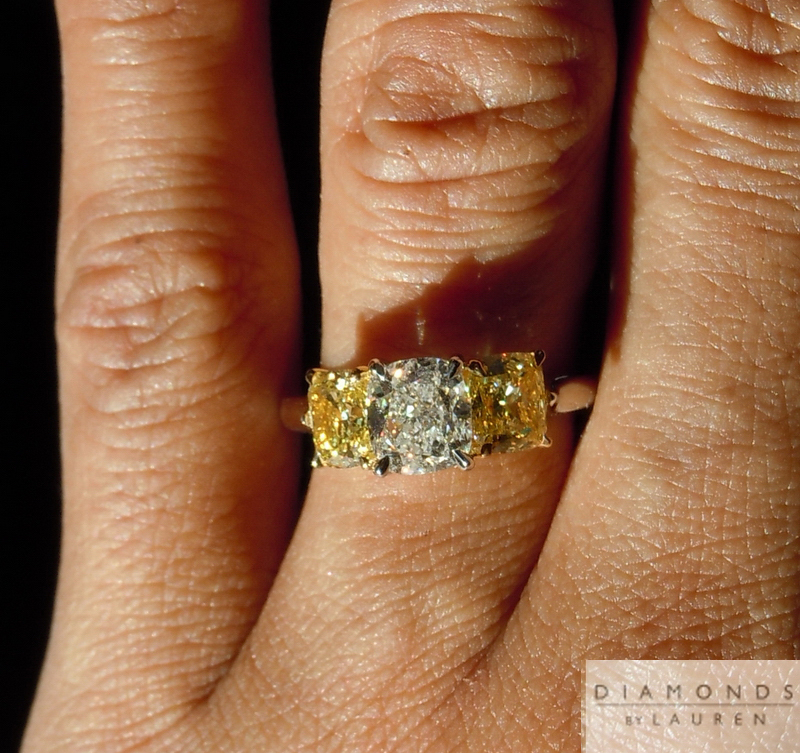 The 3.03ct total weight is spread out almost 15mm across your finger. 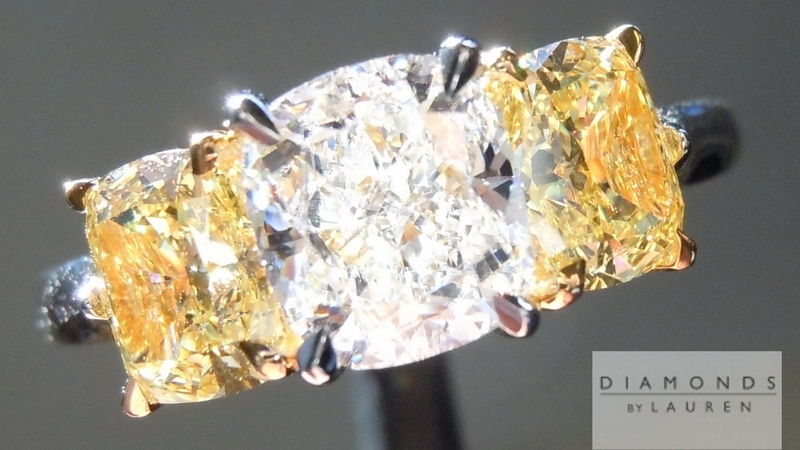 This is an exceptional diamond from so many standpoints It is a 1.40ct - very rare size. 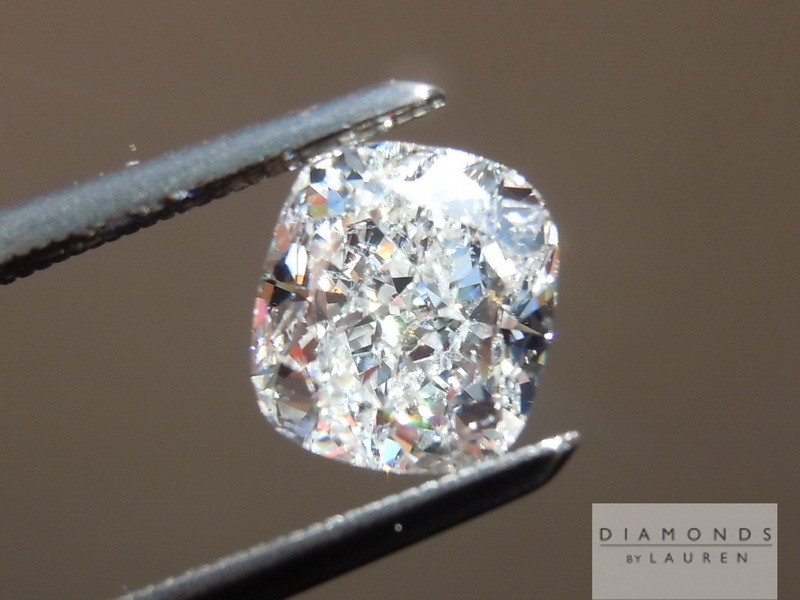 You pay based on the price for a one carat, yet it is quite close to a carat and a half. The color is super white. Perfectly eye clean SI1. 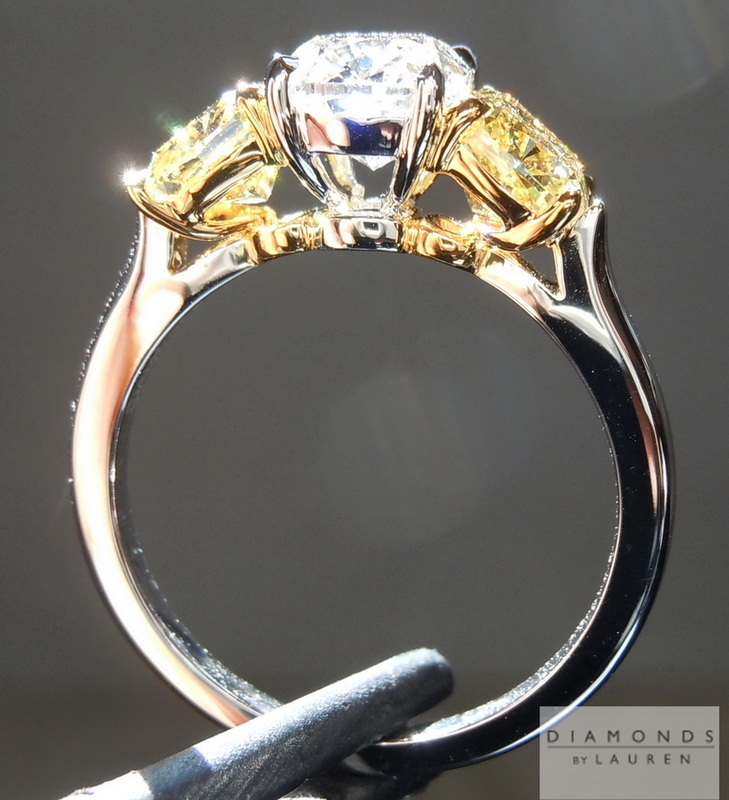 However, what really makes the stone stand out is the cut. An extremely pleasing shape - with remarkable sparkle stem to stern. Plus you get another added benefit from the remarkable cut. 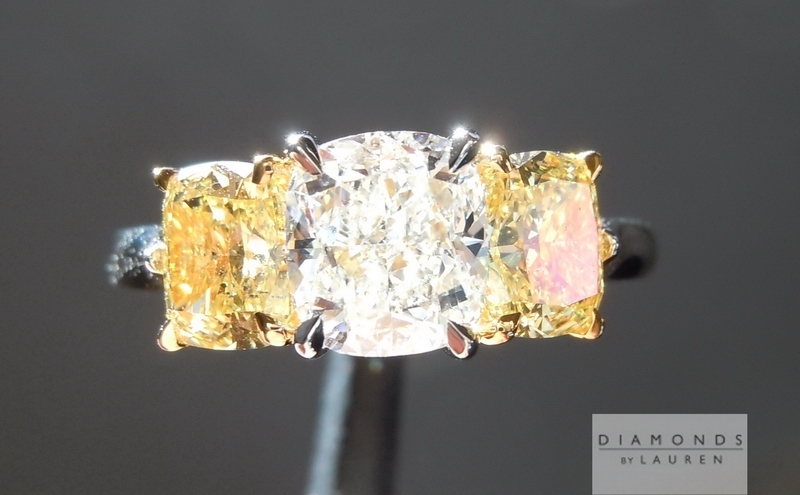 The stone looks like a 1.70ct. 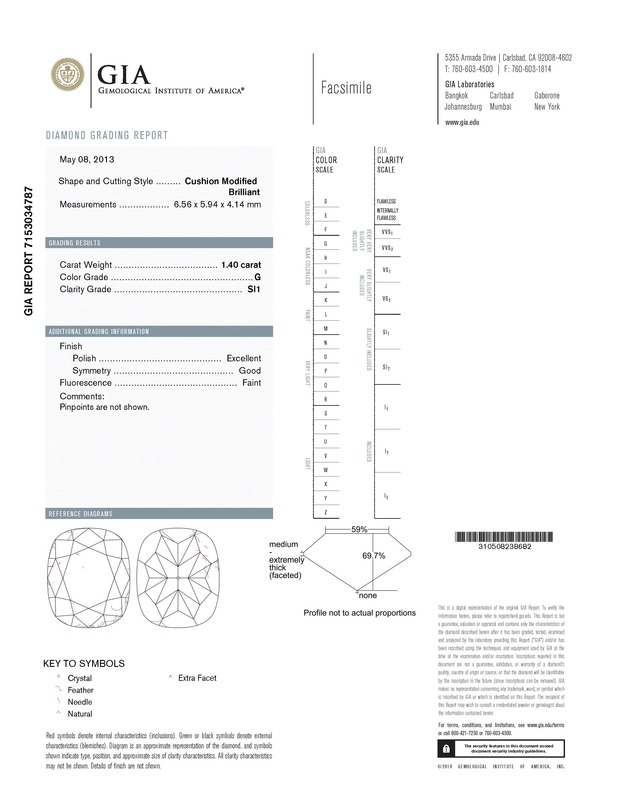 So you're paying based on the one carat list, and the thing looks visually, almost two carats! 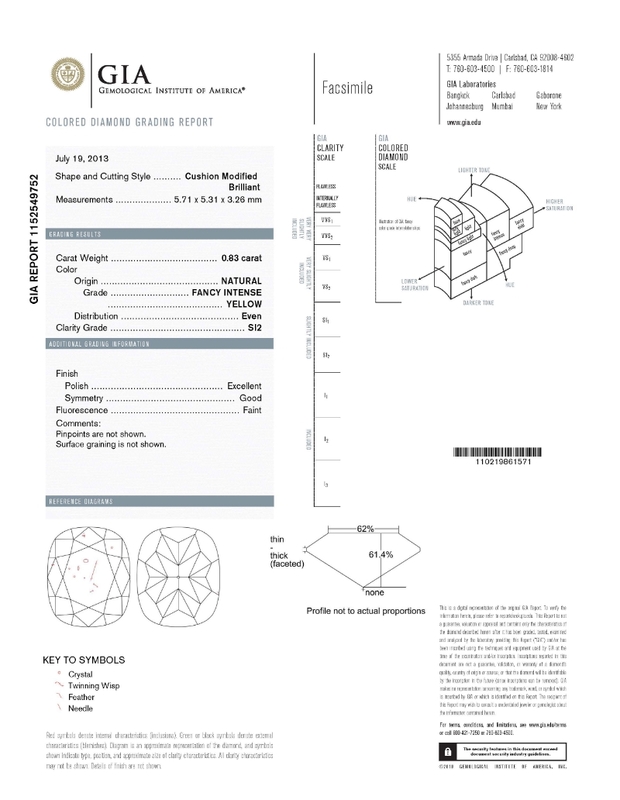 Check out the price of 2ct eye clean G SI1 Cushions.